The Stock Market Crash Great Depression was a severe worldwide economic depression. This is the grand daddy of all bear markets. Investors lost 86% of their money over this 813 day beast. This stock market crash combined with the 1929 crash, makes up the Great Depression. The depression originated in the U.S., starting with the fall in stock prices that began around September 4, 1929 and the biggest bear market ever lasted until the late 1930s or early 1940s. 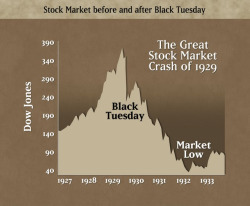 Black Tuesday, October 29, 1929, usually marks the point where the Roaring 20’s ended and the Great Depression started. The stock market continued to fall until bottoming out in July of 1932. In just two months, September and October OF 1929, wall street had lost 40 percent of its value. If you had $1000 on 3 September 1929, it would have been worth only $108.14 (89.2% loss) by July 8th, 1932. Full recovery of this loss didn’t occur until 1954, 22 years later! Having said that, if you were astute at Selling Short, you made a ton of dough! Besides the Wall Street stock market crash, the Great Depression had devastating effects in virtually every country around the world. By mid-1930, interest rates had dropped to low levels. But expected deflation and the continuing reluctance of people to borrow meant that consumer spending and investment were depressed. By May 1930, automobile sales had declined to below the levels of 1928. Prices in general began to decline, although wages held steady in 1930; but then a deflationary spiral started in 1931. Conditions were worse in farming areas, where commodity prices plunged, and in mining and logging areas, where unemployment was high and there were few other jobs. The stock market actually recovered about 60% between November 1929 and April 1930. Then the market started a slide in April 1931 that continued until July 8, 1932 when the stock market bottomed at 41.32, an 89% decline from its peak. The 1929 stock market peak of 381 would not be seen again until 1954. Ironically, 16 out of the top 20 one-day record percentage gains for the stock market were during the depression. 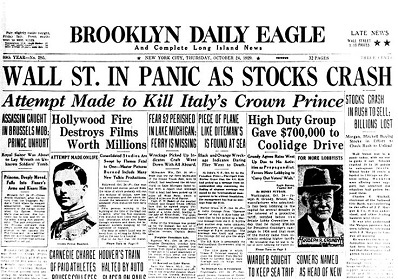 On October 30, 1929, just two days after Black Tuesday, the market went up 28 points, which was 12.3%. And you thought the stock market has been volatile the past couple of years! The prosperity of the 1920s was unevenly distributed among the various parts of the American economy, with the result that the nation's productive capacity was greater than its capacity to consume. In addition, the tariff and war-debt policies of the administrations of the 1920s had cut down the foreign market for American goods. Finally, easy-money lending policies led to an inordinate expansion of credit and installment buying and fantastic speculation in the stock market... the banks got into big trouble. Now…doesn’t this all sound familiar?! Various countries around the world started to recover from the Great Depression at different times. In most countries of the world, recovery from the Great Depression began in 1933. In the U.S., recovery began in the spring of 1933.However, the U.S. did not return to 1929 GNP for over a decade and still had an unemployment rate of about 15% in 1940, albeit down from the high of 25% in 1933. Many believe that it was the start of World War II in 1941 that ended the great Depression. Others say that isn’t true and that the economy was starting to rebound in 1938 before the US entered the war. It could still be true that the war helped since World War II started in September 1939 when Germany invaded Poland and the US went into production to manufacture many items the British were going to need soon. Return From "Stock Market Crash" to "Nuts & Bolts Stock Market Information"
Return From "Stock Market Crash" to the Home Page "Stock Market For Beginners"